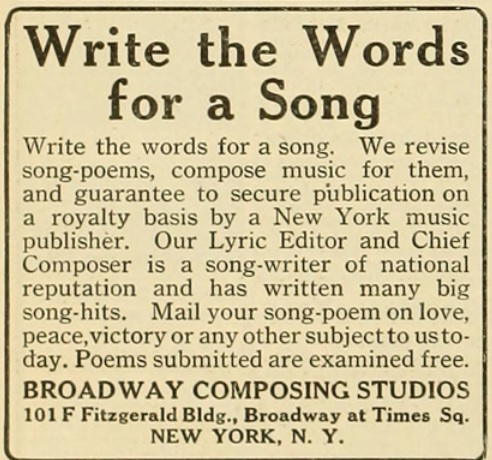 First up, here's one more song-poem ad from 1919, again from a Photoplay magazine, courtesy of Pete. "Reaper Block" was the name of a block within the Loop, in Chicago, built not long after the great fire. I'd never heard of that before seeing this ad. 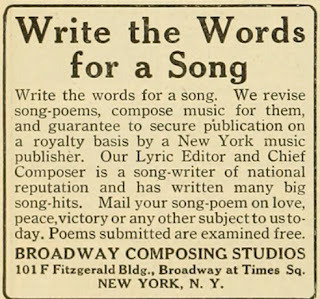 About ten days ago, I heard from a fellow named Justin, with whom I'd been in touch a year or two ago, regarding song-poems which are related in one way or another to the Vietnam War. 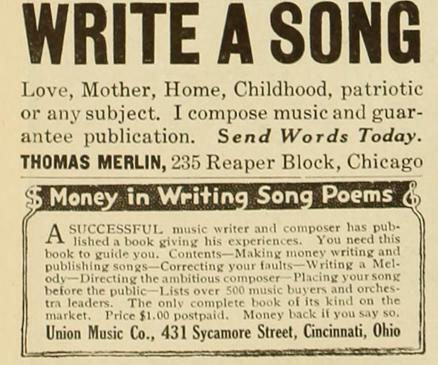 He has a project regarding songs related to that war, with one of the sub-headings being Vietnam related song-poems. 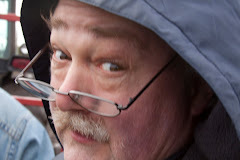 He was writing to give me an update on his blog, which is part of the project, and which you can find here, and to ask if I had discovered any further songs which would fit his project. 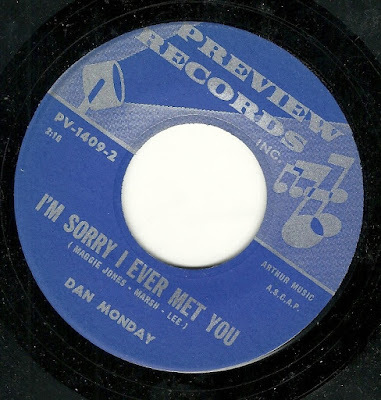 By absolute coincidence, the next Rodd Keith record I'd put aside (and this pile has been there for months), is, of all things, a Vietnam era song from a soldier to his girl. I did not plan this, it just worked out perfectly - I didn't even recall from the title that it was a soldier's song, as the relatively generic title, "Please Don't Forget Me", doesn't give that away at all. 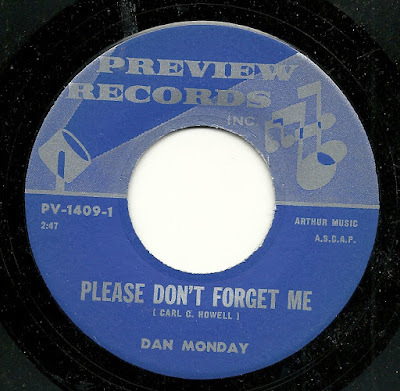 So please, everyone, and particularly Justin, enjoy Rodd Keith, under the pseudonym of "Dan Monday", with a rather weepy, but not unappealing song meant to be sung across the ocean. On the flip side, we've got a backing track that Rodd used repeatedly, for country flavored numbers, usually ones which end up a bit more sappy than this one. 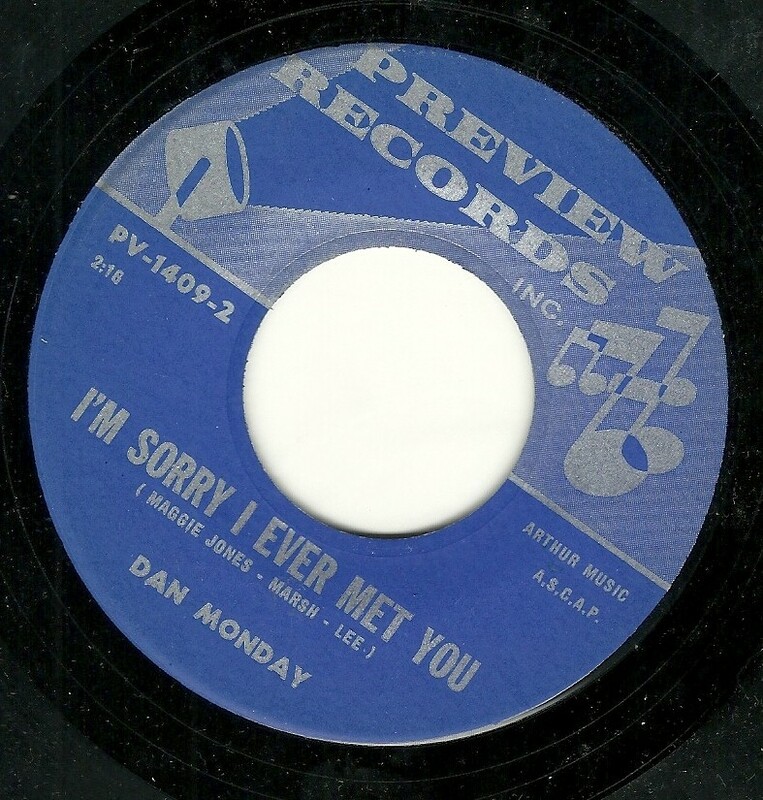 "I'm Sorry I Ever Met You" is the title, and it doesn't do much for me one way or the other. 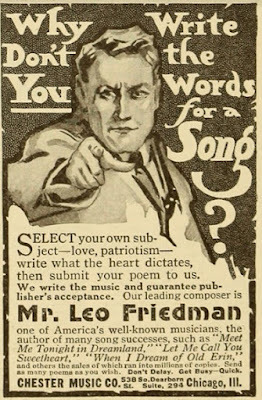 To lead off, here is yet another 1919 Photoplay Magazine song-poem ad, courtesy of ace correspondent Pete. Thanks again! Today's post is a little unusual and a lot of wonderful. It is unusual in that these are not records from my collection (therefore, there are no label scans), and are from a label I've never featured before, or even seen. It's wonderful in that these came to me from a family member of the man who owned that label, Jerome Records of Berwyn, IL, and who has seen fit to send me three records from the family collection so far, two of which feature well known song-poem singers, and which represent at least two different song-poem factories. So first, thanks VERY MUCH to Tracy, for sending along these treasures, and here's hoping there will be more to come. First up is Rod Barton (who is also the only singer from the song-poem world who I've been lucky enough to speak to), with the fantastically titled "Rotating Momma". Often, when there is a fantastic title, the record doesn't live up to the expectations that such a title encourages, but in this case, they are fulfilled, with a rollicking, backwoods, bluesy number, complete with cash register sound effects and genuinely odd lyrics. And then there's the fantastic vocal from Mr. Barton, making the whole thing work another 100% better. Next up is someone named Nancy Sherman, whose name turns up here and there on (mostly) the tiny labels which took their recordings from the larger song-poem factories. I'm not sure what the underlying commonality is between the Jerome, Lane and (the particularly obscure) Novart labels, but her name shows up on all three, as well as the larger Air label. This particular track, which boogies along not wholly unlike "Rotating Momma", is titled "Loverman", and it's another nice slice of blues and rockabilly flavored oddness, with some nice guitar, and a slinky lead vocal. Quite a bit less interesting to me is the third offering, mostly because it comes from the bland Lance Hill, and therefore, from the Globe song-poem factory, whose work I often find bland, as well, particularly in its later years. This one is called "If I Were You", and features a generic backing and standard issue sax bleating, plus a vocal which is downright uninspired, compared with the two other tracks from the label that I sampled above. Again, many thanks to Tracy! Time is tight again this week, and so my pithy remarks will have to wait for another day. 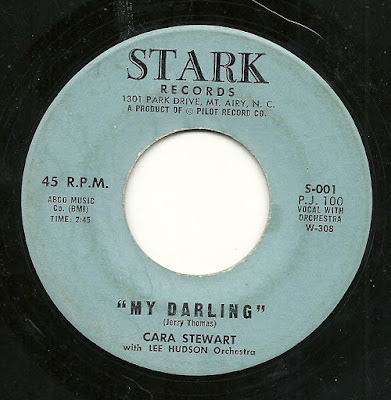 But there isn't really that much one must say about Cara Stewart - her lovely voice could sell just about anything. Here she is on a previously unknown label - Stark Records of Mt. 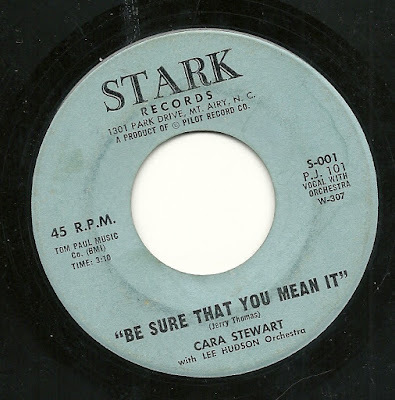 Airy, N.C. (perhaps the pet project of song-poet Jerry Thomas) - singing "Be Sure That You Mean It"